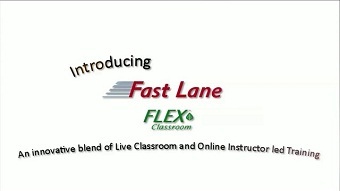 Fast Lane's FLEX™ Classroom is the newest delivery method that reflects Fast Lane's efforts to "Go Green and Save...". Cut travel costs and choose from our growing selection of Guaranteed dates. With FLEX™ Classroom, course selection becomes more flexible. Choose to attend via the Internet or attend the class in-person. Either way, your experience will be equally as effective including all hands-on labs. Remote students can attend from their home or office, saving you time and money on travel and accommodation. FLEX™ is about delivering flexibility, choice and a quality training experience. All courses are delivered in real time by Fast Lane's leading Subject Matter Experts across the region, direct into our state of the art training facilities. With our reliable and robust training schedule you are able to select from a number of our leading technology vendors. View our full CEE training schedule below or click here to view our EMEA FLEX™ schedule.